"We appreciate gifts, but free, unconditional, and without ulterior motives." In November 2016, contemporary American artist Jeff Koons announced that he would donate a sculpture to the city of Paris to commemorate victims of recent terrorist attacks in the French Capital. Produced with funds from French and American donors, the vibrant and colorful sculpture is near completion. However, its future home is still undecided and proving extremely controversial. Now, French artists, curators, and politicians are calling for the costly and logistically complex project to be abandoned. The project was announced a year after the November 2015 Paris attacks and was suggested by Jane D. Hartley, the U.S. ambassador to France at the time. The statue itself is 34 feet high, 27 feet wide, and 33 feet deep- one of Koons's largest sculptures to date. It is meant to echo the Flame of Liberty- a gift from France to the United States, and a monument to Franco-American solidarity. "I hope the work is life changing to people," said Mr. Koons in an interview with the New York Times. "I hope that 'Bouquet of Tulips' can communicate a sense of future, optimism, the joy of offering, to find something greater outside the self." "My hope is that this amazing sculpture will bring visitors to Paris," said U.S ambassador Jane D. Hartley in 2016, as Paris tourism had declined dramatically after the attacks. For Paris Mayor Anne Hidalgo, the sculpture would "bear witness to the irrevocable attachment between our capital and the United States." The plan was to install it permanently in the plaza in front of the Museum of Modern Art and the Palais de Tokyo, two of the city's most important art spaces. However, this decision has faced backlash from the Paris community. A group of 24 French artists, museum workers, and others expressed their distaste for the piece in an open letter published in Liberation, calling for the City of Paris to reject the sculpture entirely. They described it as "shocking," and call the work itself and the choice of the site "at the very least surprising, if not opportunistic, perhaps even cynical." "Brilliant and inventive in the 1980s, Jeff Koons has since become a symbol of industrial, spectacular ad speculative art," the letter reads. "His studio and his dealers are multinational purveyors of hyper-luxury, among others. To offer them so much visibility would amount to advertising or product placement." Many believe that the choice of work and the location has no kind of relationship to the tragic events invoked and where they took place. "When there are horrible shootings, the custom is to put flowers on the floor, humbly, in a gesture of sorrow and respect. In this case, it is a triumphant erection with no meaning at all, in a Disneyland aesthetic," artist Tania Mourard wrote. "I think the best place for it would be in front of Trump Tower in New York." "Jeff Koons's current practice is closer to entertainment and speculation than to what I call - and what I believe what most of the French would call - 'art,'" wrote Stéphane Corréard, director of the Galeristes salon, in an email to Artnet News. 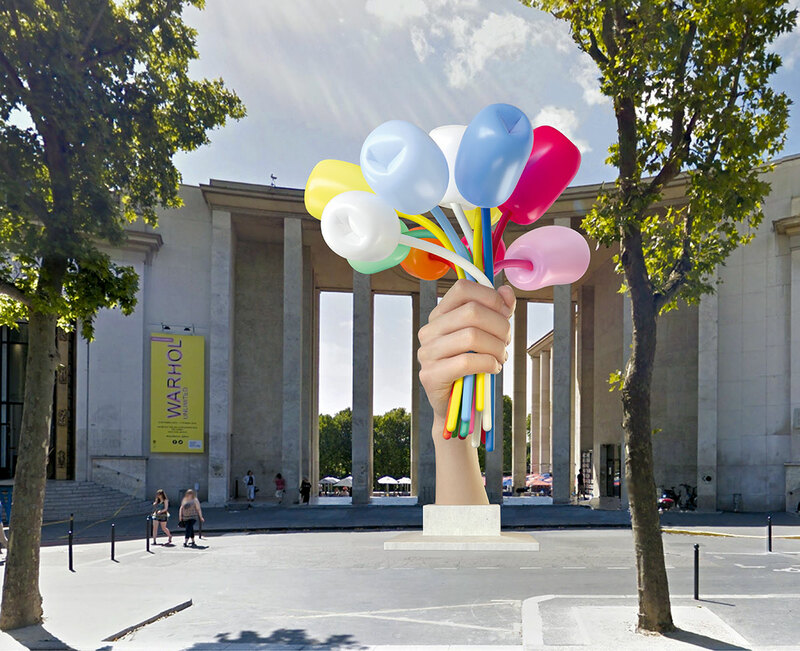 "Installing such a sculpture in front of the [Palais de Tokyo] museum would make no sense. It would be like putting a Ronald McDonald statue in front of a gastronomic restaurant!" There are several engineering issues with the sculpture. The sidewalk where the sculpture would be installed cannot currently hold its weight and would need to be reinforced - a project that could take several months of construction, rendering many areas of the Palais de Tokyo unusable for a long time. Lastly, the installation would be expensive for French taxpayers. 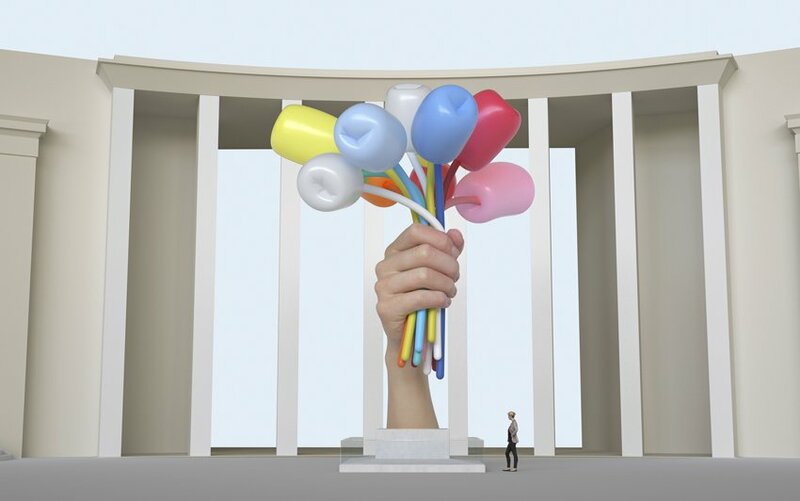 Koons gifted the "idea" for the sculpture, but its construction and installation (estimated 3.5 million euro at least) will be financed by arts patrons, (French arts patrons specifically) who would benefit from tax abatements of up to 66% on their contributions. This is not the first time Mr. Koons' work has proved controversial in France. In 2008, some of his work was displayed at Versailles, part of a program showing art at that particular site. French critics questioned "the intrusion within the walls of the chateau of 16 giant glittering sculptures by an artist considered the paragon of kitsch." Six years ago, in a review of Mr. Koon's work at the Pompidou Center in Paris, Le Figaro asked in a headline whether he was an "imposter or a creator." Despite the numerous complaints of Parisians and artists, the decision to install his sculpture is still up in the air. Originally from New York, Amanda is an AUP freshman studying International and Comparative Politics.